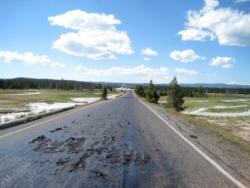 Hot tracks: Portions of the Firehole Lake Drive in Yellowstone National Park have melted from underground thermals that have released heat to the surface.Courtesy National Park ServiceYou don't go to Yellowstone National Park to look at the roads. The vast array of flora and fauna specimens to observe along with amazing geology make it one of our national treasures. But the geology part is making it hard to see the bioiogical features of one section of the park. This week heat from underground thermals in the park's lower geyser basin has melted through the surface of the Firehole Lake Drive. And park staff has closed off that section of the park to foot traffic as well, noting that the stirring hot water and energy under the ground could be eroding away and the top surface just be "crust" covering vacant space below. It's all just another reminder that we're just visitors to the natural forces at play in our wild word.